Overview: Working with Klips – How can we help you today? What is a Klip? A widget that visualizes data for your dashboard. What is a component? The individual attributes that control the style and properties of the Klip. 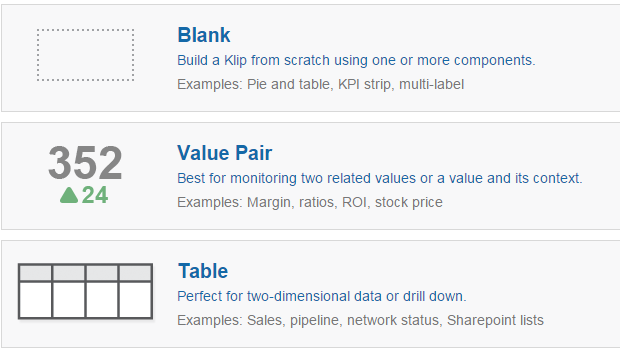 A Klip is a widget used to visualize your data using formats such as charts, tables, and gauges. Klips are comprised of components, attributes that control the important properties associated with your Klip. A good way to think of the difference between a Klip and a component is to think of a Klip as a container, and a component as what's inside the container. Note: These steps provide a general overview for building a Klip. For more detailed instructions, visit the Klip tutorial section. When building a new Klip, you will be prompted to choose from a list of component styles. You also have the option to choose a Blank slate, where you can add components later. Select the component style you want to use. You can also visit our Sample Data section. Each component type has different sub-components associated with it, so it's important to note that the following steps only illustrate the typical workflow for assigning data to a sub-component. For more information on this step, visit: how to use the Klip Editor. Select a sub-component from the component tree. Use the Properties panel to adjust properties associated with each of your sub-component. Commonly used properties include font style, prefixes and suffixes, and setting update animations for the Klip. When you are done building your Klip, click the Save button at the top of the Klip Editor. On the next screen, make sure to share the Klip with the appropriate groups in your organization. This will make creating and sharing dashboards within your organization much easier in the long run - see this article for more information: checklist for adding new users.